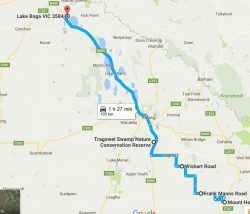 Swan Hill is the site of camp 15, but I am staying for 2 nights at Lake Boga just south of Swan Hill. Before I cover today’s journey it seems I forgot to cover camp 5, the camp before camp 6 at Mia Mia. 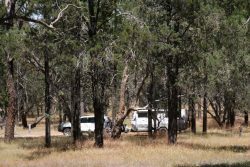 Camp 5 was 15 Km along the Bourke and Wills Track after leaving Lancefield, the road follows their journey, hence the name. There was nothing to distinguish the camp so I didn’t take any photos. Thanks Deen. 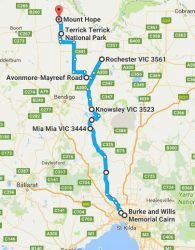 Today I went back to Elmore from Rochester and followed mainly minor dirt roads that zig-zagged along and across the track Bourke and Wills followed. The roads were very dry and the dust was amazing, as bad as any I have travelled. 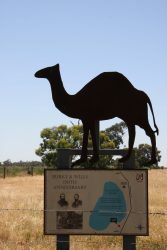 A lot of the journey between Elmore and Kerang travelled through lots of swamp country and Bourke and Wills had difficulty crossing the swamps with their wagons and camels. It was cold and wet through this part of the trip, which added to their misery. 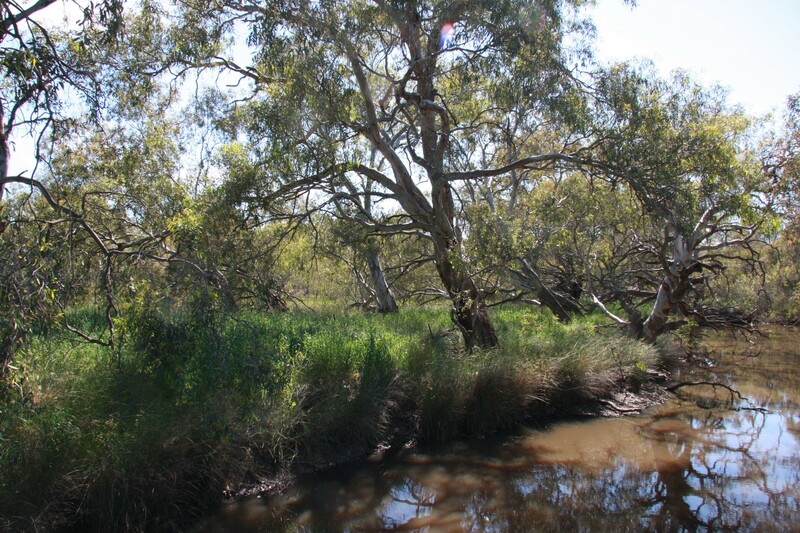 The journey started getting all the team across the Campaspe River on a punt at Barnadown camp 8 as I mentioned. The river crossing was reported as “a tedious if not dangerous operation”. Lots of people from Bendigo watched them set off and a number of the party were entertained by local landowners. Bourke wanted to increase the size of the party with a saddler and second surveyor plus a man he met in Castlemaine. From Barnadown they headed across the Terrick Terrick Plains which are extremely flat with no hills until the Terrick Terrick hills. Camp 9 was at Quinlivens Bridge, nothing marks the site but is is a nice creek. 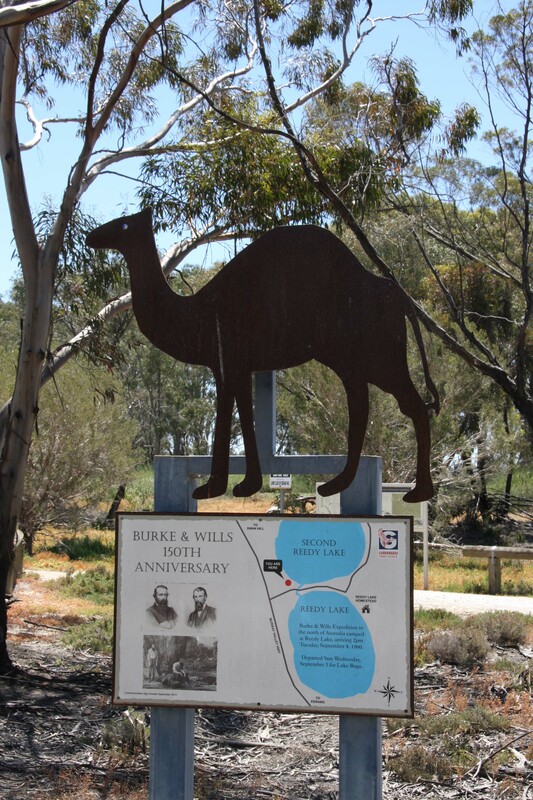 They did have a problem keeping the unfettered camels close to camp and often had to chase after them on horses. Not sure why they were unfettered unlike the horses. There was a cameleer in the party but he and Bourke often were at odds. The cameleer had a few barrels of rum which he used to calm the camels. Lots of zig-zagging on some very minor roads got me to camp 10 at Oak Ridge just near Terrick Terrick National Park. It was in flat cropping country with little of note except a crop duster plane flying back and forward over a crop about 20 feet above the ground right along side the road and then pulling up over an single strand power line and immediately dropping down again. Completely fearless but exciting to watch. 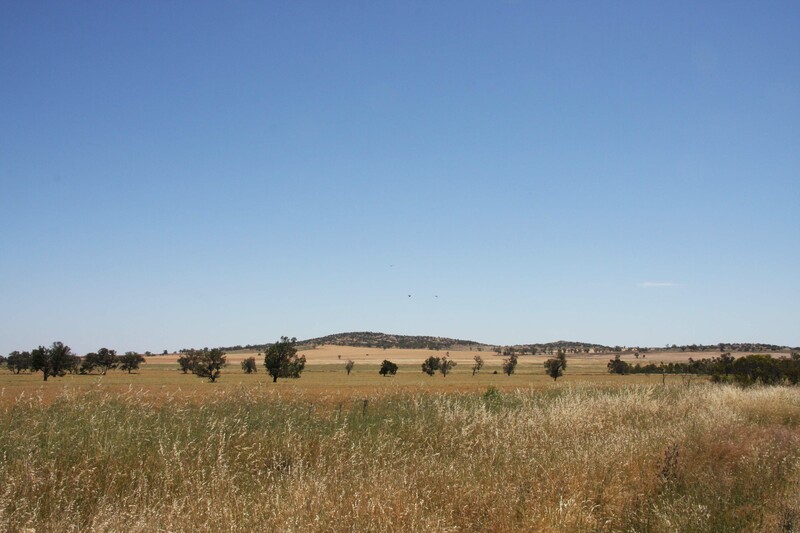 The expedition climbed the Terrick Terrick hills to get their first good view of the surrounding area. 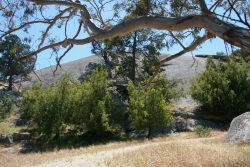 The National Park is very dry and rocky and the camping area poor, so I decided not to stay, but I did walk around a bit. Marg and I visited Terick Terrick for a picnic a few years ago, it looks just the same, but there is (or should it be are?) heaps of bird life. There was a station at Mt Hope that the expedition visited, but to call it a mount is a major exaggeration, but Camp 11 was made here. 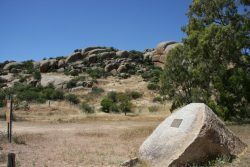 Major Mitchell named Mt Hope on his Australia Felix exploration, but as you can see it from the photo it is not a mountain. I then zig zagged again across some ordinary flat country passing many abandoned farmhouses to Tragowel Swamp. Bourke and Wills were travelling through some cold, wet and windy weather so things were not too comfortable and some horses escaped from a paddock so they wasted time chasing these down. They did comment that the journey to Tragowel was the worst so far because of the weather. Camp 12 was on the edge of the swamp and there is a commemorative sign. 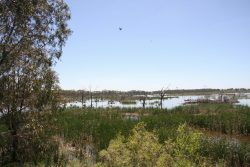 The swamp is a wetland but with lots of dead trees so it is not too attractive. They arrived here at 6.30 pm and left at 9.15 am so they did put in big days and got going early. The camels were really suffering in the cold, mud and rain and Landells the cameleer gave them big doses of rum to warm them up (he had bought 60 gallons of rum for the purpose). Fortunately there was a station nearby so they could enjoy some hospitality. They decided to have a rest day at Tragowel. The next day they travelled over muddy ground to the Loddon River and crossed this at a drovers crossing and found that the roads now were reasonable. They set up Camp 13 at Reedy Lake Station. 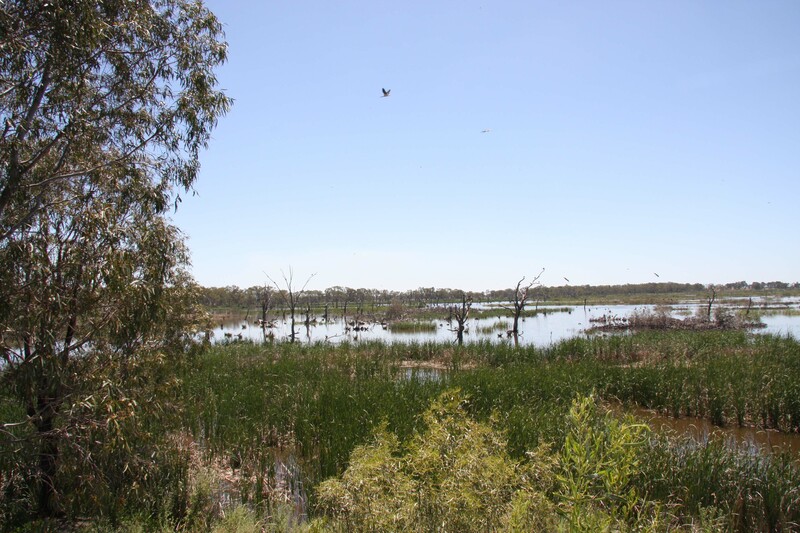 Reedy lake is a RAMSAR wetland and has masses of birdlife which you can view from a two story bird hide. There is a nice picnic area here as well. 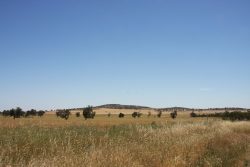 Their track follows the Murray Valley Highway so it was much easier for me after the dusty dirt roads. After Reedy Lake I headed to Lake Boga for a couple of nights. 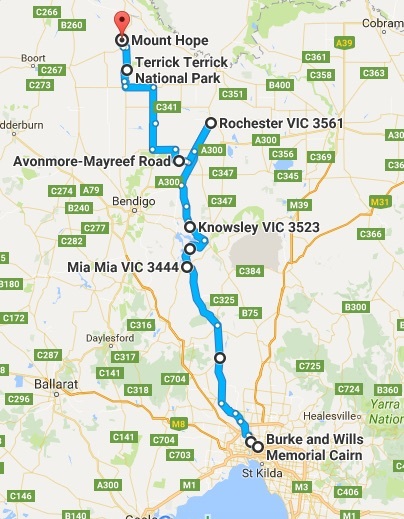 Marg’s dad worked with the RAAF at Lake Boga during WW2 servicing flying boats, so I will have a look at the museum and visit Swan Hill following the VEE (Victorian Exploring Expedition) as it is known. I passed Camp 14 at The Clump, but there was nothing to distinguish the camp from the surrounding country. Google maps only allow 10 destinations so the map above is my journey to Mt Hope. It is much more zig zag than shown but most of the roads are not in Google maps. So the journey from Mt Hope to Lake Boga is below. Again there were many more minor roads than Google maps show.